Born May 27 18573,9,10,11,12,13 [May 21 185714,15, about 185516], Holly Spring MM, Randolph County, North Carolina3,9,10,11,12,13. He married Hannah Ludora "Dora" Chance [Ludora Chance2,14,17,18], Oct 22 1880, Westfield, Hamilton County, Indiana. Hannah, daughter of Joshua Chance & Mary Lydia Jessup19,20, was born Sep 26 186519,20 [Sep 27 18642,3,5,9,10,15], Westfield, Hamilton County, Indiana19,20. Hinshaw, John R., head-of-household, age 43, born May 1857 in North Carolina; parents born in North Carolina; married 20 years; occupation: farmer; owned farm (mortgaged). Hinshaw, Ludora, wife, age 35, born Sep 1864 in Indiana; father born in Ohio; mother born in Indiana; married 20 years; 7 children, 7 living. Hinshaw, Verlin C., son, age 18, born July 1881 in Indiana; father born in North Carolina; mother born in Indiana; attended school 6 months. Hinshaw, Goldie L., daughter, age 16, born Sep 1883 in Indiana; father born in North Carolina; mother born in Indiana; attended school 1 month. Hinshaw, Halsie, daughter, age 14, born Nov 1885 in Indiana; father born in North Carolina; mother born in Indiana; attended school 3 months. Hinshaw, Orla J., son, age 11, born Aug 1888 in Michigan; father born in North Carolina; mother born in Indiana; attended school 7 months. Hinshaw, Alfred, son, age 8, born Mar 1892 in Michigan; father born in North Carolina; mother born in Indiana; attended school 7 months. Hinshaw, Ester, daughter, age 5, born Mar 1895 in Michigan; father born in North Carolina; mother born in Indiana. Hinshaw, Lowell, son, age 2, born Aug 1897 in Michigan; father born in North Carolina; mother born in Indiana. Hinshaw, J.R., head-of-household, age 53, born in North Carolina; parents born in North Carolina; first marriage, married 30 years; occupation: farmer, general farm; owned farm (free). Hinshaw, Dora, wife, age 44, born in Indiana; parents born in Indiana; first marriage, married 30 years; 8 children, 8 living. Hinshaw, Ester, daughter, age 15, born in Michigan; father born in North Carolina; mother born in Indiana; attended school. Hinshaw, Lowell, son, age 12, born in Michigan; father born in North Carolina; mother born in Indiana; attended school. Hinshaw, Janice, daughter, age 5, born in Kansas; father born in North Carolina; mother born in Indiana. Hinshaw, John R., head-of-household, age 62, born in North Carolina; parents born in North Carolina; owned home; occupation: farm [..unclear..], general farm. 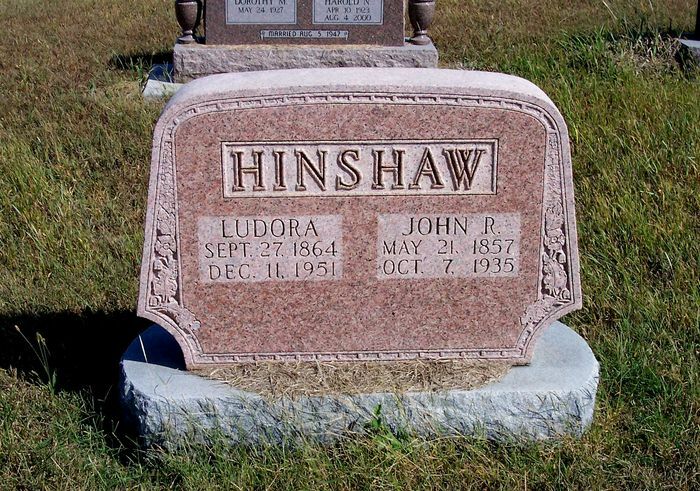 Hinshaw, Ludora [unclear], wife, age 55, born in Indiana; father born in Ohio; mother born in North Carolina. Hinshaw, Lowell, son, age 22, born in Indiana; father born in North Carolina; mother born in Indiana; occupation: laborer, farm. Hinshaw, Edna, daughter, age 15, born in Kansas; father born in North Carolina; mother born in Indiana; attended school. Hinshaw, John R., head-of-household, age 72, born in North Carolina; parents born in North Carolina; first married at age 23; owned home; no radio in home; occupation: none; not a veteran. Hinshaw, Ludora, wife, age 64, born in Indiana; father born in Ohio; mother born in North Carolina; first married at age 15. John R. Hinshaw, son of Elias and Marticia Hinshaw, was born in Randolph County, North Carolina, May 21, 1857, and died at his home near Rose Hill, October 7, 1935, aged 78 years, 4 months, and 16 days. He was united in marriage with Ludora Chance, October 22, 1880, and to this union was born eight children, Verlin C. of Clearwater; Mrs. J.O. Thompson, of Douglass: Mrs Otha McKnight, Phoenix, Arizona: Orla, Holiday, North Dakota: Alfred (deceased): Mrs Virgil Reyer, Rose Hill, KS: Lowell, Rose Hill, KS and Mrs. Irl Pratt, Wichita, KS. He leaves, beside his children, his wife, Ludora, and five brothers, Newlin, Nobelville, Indiana; Stephen, Argonia; Abijah, Rose Hill, KS; Franklin, Ramseur, North Carolina; Levi Clarkson Hinshaw, Huntington Park, California; Lindley and Isaiah proceeding him in death; also 25 grand children and nine great grand children. He was a birth right member of the Friends church, and was faithful in his attendance, and taught a Sunday School class from early manhood until his failing health. He loved his Bible and spent alot of time in religious study. His biggest concern until the end was for his family and Sunday School class. Telephone interview with Arlene Hinshaw Johnson. RootsWeb WorldConnect data by Mike Hatherly (). 1910 census, Richland Township, Butler County, Kansas; roll T624-433, ED 23, page 202B, line #51, dwelling #93, family #95. 1920 census, Richland Township, Butler County, Kansas; roll T625-524, ED 34, page 4A, line #21, dwelling #83, family #85. 1860 census, Moffetts Mills P.O., Eastern Division, Randolph County, North Carolina; roll M653-910, page 249, line #23, dwelling #309, family #309.
newspaper obituary of John Randolph Hinshaw. Indiana Marriages, 1845-1920; http://www.ancestry.com (Book 6, page 249). 1930 census, Richland Township, Butler County, Kansas; roll T626-695, ED 39, page 4A, line #48, dwelling #84, family #84. Contribution from Wende Dragoset ().